Virtually every team in the NBA was in action on the final Sunday of the regular season, as there were 14 games on the schedule. While some squads are just days away from summer vacation, others are gearing up for the playoff push. Starting things off, the Raptors took down the Heat in overtime to put Miami on the brink of being eliminated from the playoffs. In addition, the Thunder also continued to build momentum for the postseason as they pulled off a comeback win against the Timberwolves. Later on, at least a portion of Eastern Conference playoff positioning was decided with the Nets clinching a playoff spot for the first time in four seasons with a win over the Pacers. The Trail Blazers finished off the night by topping the Nuggets in a game that definitely benefitted them. Portland now is in firm control of the fourth seed in the Western Conference after the Clippers fell to the Warriors in the final regular-season game at Oracle Arena. Here's everything you need to know about Sunday's action. The Trail Blazers are looking to lock up home court advantage in the opening round of the postseason. Damian Lillard poured in 30 points and his performance went a long way towards making that a reality. Stephen Curry has blossomed into one of the top shooters in the history of the NBA. 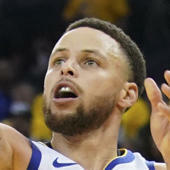 With the Warriors wearing their "We Believe" jerseys in their final regular-season game at Oracle Arena, Curry scored 27 points and led the charge in a win over the Clippers. Giannis Antetokounmpo missed Milwaukee's last game as he battled a calf injury. However, the Bucks star forward returned with a vengeance and scored 30 points in a win over a shorthanded Hawks squad. The Rockets dominated the Suns as they knocked down 27 threes on the night. MVP candidate James Harden scored 30 points and hit five of his six attempts from beyond the arc. The Nets haven't been to the postseason in four seasons, but that all changed on Sunday. All-Star guard D'Angelo Russell led the way with 20 points and six assists for Brooklyn. Kemba Walker dazzled in a game that the Hornets needed to win if they wanted to stay in the postseason race. Walker scored 31 points to help pull Charlotte to within one game of the final playoff spot in the East. LaMarcus Aldridge always provides a steady presence in the Spurs frontcourt. In a win over the Cavaliers, Aldridge scored 18 points on 6-of-14 shooting while securing 13 rebounds. Russell Westbrook clearly has made a habit of recording triple-doubles in his sleep. Westbrook finished Sunday's win over the Timberwolves with 27 points on 10-of-22 shooting to go along with 15 assists and 10 rebounds. D'Angelo Russell and Joe Harris connected for an unorthodox alley-oop early on against the Pacers. Russell lobbed it up for a cutting Harris, who caught it in mid-air and spun it home off the glass for the reverse alley-oop lay-up. Karl-Anthony Towns added another big dunk to his impressive highlight reel this season. Catching the Thunder napping in transition, Towns got ahead of the defense and rocked the rim. Russell Westbrook is unstoppable in transition, whether he's taking it to the basket or dishing to a teammate. On this occasion, it was the latter, as he tossed a no-look dime to Steven Adams after using some nice dribbling moves. Channing Frye is set to retire after the season, and the Cavaliers honored him during Sunday's game against the Spurs. Kevin Love pulled off a unique tribute by checking into the game wearing Frye's old college jersey. The Raptors needed overtime to defeat the Heat, but they got the victory thanks to a true team effort. Four players scored at least 20 points, led by Norman Powell and Pascal Siakam, who each put up 23. Meanwhile, Kawhi Leonard went for 22 and Danny Green added 21.